Many people ask, exactly what is RYZE.Ai? To put it simply RYZE is an Artificial Intelligence software program that uses an algorithm and conducts currency trades using a variety of strategies. In other words, RYZE.Ai analyzes the currency markets and makes trades in order to generate profits for Hodo Global members with brokerage accounts subscribed to RYZE.Ai. The RYZE.Ai program or system is available to HODO Global Partners. RYZE.Ai is a subscription based system for the Partner to utilize to trade currencies in their own personal brokerage account. Each person has complete control of their own brokerage account and their funds. While the person has RYZE.Ai activated it will conduct trades. The size of each trade is proportional to the size of your brokerage account. This means that that if RYZE.Ai executes a trade a partner with a $5,000 account will earn profits twice the size of a partner with a $2,500 account. This keeps the exposure or risk of the trade proportional regardless of account size. Yes, you certainly can. While past performance is not a guarantee of future results, RYZE.Ai has performed excellently up to this point. In today’s post I will document the trades and results for the week ending April 7th, 2017. These are all the closed trades that the RYZE.Ai program conducted the week ending April 7th, 2017. The statistics for this week are pretty interesting and also typical for the RYZE.Ai system from what I have seen. The results show that overall the trades were positive and my account made money this week. I will delve into some of the statistics below. This week there were 326 trades executed in the account. Of these trades 183 were basically a wash, that is the net was effectively zero. How can that be? Remember, the RYZE.Ai system spreads trades across many account. So, for any given trade you own just a tiny fraction. When the trade has a very small profit or loss and you spread that across many accounts the net result can be less than one cent and thus shows up as zero. People with larger account balances would probably have far fewer of these zero trades than a smaller account. Out of the 143 non zero trades, there were 99 winners and 44 losers, which means there are about 62% winners. This means that this week there were not quite 2 winners for every loser. The average winner was $.19 and the average loser was $.075. This means that the average winner is almost 2.5 times the average loser. So, how did the account do this week percentage wise? It was up .51%. This is one characteristic of the RYZE.Ai system that I really like. There are a lot of trades and the exposure or risk to any one trade is very low as compared to your account balance. 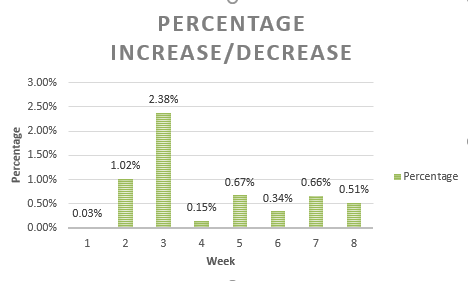 While to some people .51% for the week doesn’t sound like much, it still comes out to more than 26% per year, which is account growth I will take anytime and be very happy with. So, how does this compare to the average week? Well, for the eight week period I have tracked through April 7th the weekly average was .72%. In that perspective this week was a little subpar but I was still very satisfied. I would much rather have steady, consistent profits and watch my account grow week after week than to see wild fluctuations from day to day and week to week. I have seen other currency trading programs that promise the moon and shoot for 20% or 30% per month returns. The problem is that the risk is far higher and eventually those systems string together a couple months of losses and you lose half your account. RYZE.Ai is much different. Since the exposure is much smaller let’s pretend it did have a couple weeks of losses in a row (which has not happened, but may in the future) given the ranges you would probably be out only a few percent at most, which is recoverable. I will take slow and steady instead of larger more volatile variations every time. Slow and steady, over and over is what leads to long term gains. If you look at the table above you will see that the majority of the trades executed involved the Swiss Franc, so I think it only fitting that I include some Swiss Franc history in this post. For those of you who aren’t interested in this kind of stuff, skip ahead to the bottom for more relevant information to RYZE.Ai. otherwise enjoy. In 1798, the Helvetic Republic introduced a currency based on the Berne thaler, subdivided into 10 batzen or 100 centimes. The Swiss franc was equal to 6 3⁄4 grams of pure silver or 1 1⁄2 French francs. In 1865, France, Belgium, Italy, and Switzerland formed the Latin Monetary Union, wherein they agreed to value their national currencies to a standard of 4.5 grams of silver or 0.290322 grams of gold. 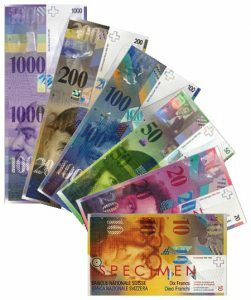 Even after the monetary union faded away in the 1920s and officially ended in 1927, the Swiss franc remained on that standard until 1936, when it suffered its sole devaluation, on 27 September during the Great Depression. The currency was devalued by 30% following the devaluations of the British pound, U.S. dollar and French franc. In 1945, Switzerland joined the Bretton Woods system and pegged the franc to the U.S. dollar at a rate of $1 = 4.30521 francs (equivalent to 1 franc = 0.206418 grams of gold). This was changed to $1 = 4.375 francs (1 franc = 0.203125 grams of gold) in 1949. If you are interested in learning more about RYZE.Ai please feel free to watch the videos here or click on the image below. There is also a Thursday evening webinar (USA and International Numbers available) that details more specifics about RYZE.Ai. You can also email me with questions or leave a comment below. Anyone who is seriously interested can drop me an email to Xin@FXTradingIncome.com and set up a time to talk in person, as well. If you are looking to subscribe, click here. I hope you enjoyed my post. New updates are coming every day. This entry was posted in RYZE.Ai Weekly Performance and tagged currency trading, forex trading, Hodo Global, Ryze.ai, Xin Zhang on April 7, 2017 by Xin Zhang. It’s always interesting to read these weekly Ryze.Ai performance reports. I’ve learned so much in the past 2 months since I’ve started reading them. I would like to get started with Ryze shortly. Since I missed that webinar about RYZE.AI, do you know if there are any others soon? I would like to get to get a better grasp of how this works so I don’t end up losing a lot of money just because I’m new to this. Thanks in advance! I am glad that you have learned a lot from my RYZE.Ai posts. It is always rewarding to hear that people have benefited from what I have written. Regarding the RYZE.Ai webinars, there is one every Thursday evening. A link yo the details is posted hete. I hope you can attend. If you need help registering, please just send me an email with your phone number and we can arrange a time to step you through everything over the phone. I am very new to trading and didn’t even know I could use something like this and I am so glad you shared it. This is really going to help me out. I am glad I could provide enlightenment on the subject of how to make money trading currencies. For most people an automated program like ryze.ai is the best answer because the don’t have the time or desire to develop the skills necessary to trade independently. I would recommend that you attend a seminar or one of the Thursday evening webinars to learn more. Please feel free to email me as well and set up a time to talk personally. that reduces the subscription fee to only $99. Wow, I had never heard of this software program! I actually learned tons about trading last year through a course that I took. I wish I would have known about Ryze back then. After going through my course last year, I realized that trading can be extremely risky and there is almost no way for me to know how I will do in any one trade. I would definitely trust a computer or software program like Ryze way more. Thanks for all the insight, statistics. Someone definitely needs to spread the word about this. Hi, I agree that trading on your own is a difficult undertaking and you never know from trade to trade how you will do. I have written many posts under the category of Xins Trading Adventures. Check them out to see what I am talking about. One of the many things I really like about RYZE.Ai is that the performance is consistent. Trade after trade, day after day and week after week the results are good. RYZE.Ai also allows people to participate in trading strategies unavailable if you are trading on your own. Strategies such as being a bridge liquidity provider and high frequency trading strategies. Consistency is what helps build wealth. For more information, drop me an email to Xin@fxtradingincome.com or leave more comments below. Hey Xin, this is very interesting, I was not aware such software even existed. I knew of tools that you can use to give you a good idea of when and where to trade, but actual AI to do it, its mind blowing. As someone who just recently started trading stocks, I’m always hesitating when it comes to buying and selling, this software would be a life saver, will check it out, thank you. Thank you for the very interesting article. I have been looking into trading for some time already and feel little resistant to trying it due to high risk. It seems to me little less risky when the software is involved but I have few questions. The returns listed over the past few months also seem consistent. Each week averages almost 1% with mo big swings at all. This sounds very encouraging to me. What is the price for this trading software? Is it possible to limit losses – like set some kind of margin when the trade is closed to avoid further losses? How long time have you been using this software?